And all of this was done with an incredibly tight timeline and budget. With just two months to fully renovate the interior of the former Mountain West Bank building located at 491 Sun Valley Road, Ketchum-based architect Susan Desko assembled a team that was equal to the task. WSG worked with the owners (Cairde Group and City of Ketchum) to design the mechanical, electrical and plumbing system that supported the Starbucks/Desko design. “Working with the owners from the start of the project to identify their needs, ensured our design and engineering work was aligned with their goals.” Pierce says. 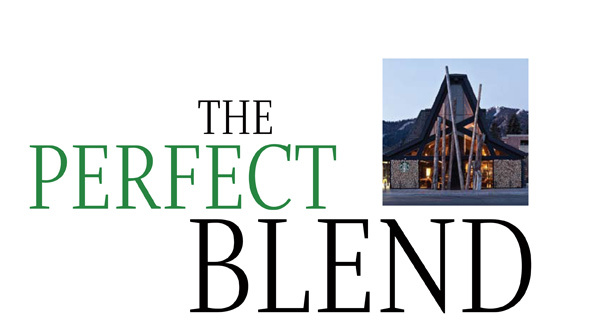 Today, coffee seekers and those looking for information on the Sun Valley area are greeted by locally harvested timber totems that reach up to the 40-foot high ceilings, glazed concrete floors and a mix of natural, industrial and technological aesthetics. The 3,500 square-foot building, originally built in the late ‘70’s, was well noted for its fantastic location anchoring the south end of the new Ketchum Town Square. However, it also presented an incredibly difficult challenge for the renovation team. Along with its A-frame construction, the building retained its old bank interior replete with an extremely inefficient HVAC system, plumbing that had caused former tenants no small expense and an unwieldy floor plan that greatly restricted potential uses. With the renovation beginning in September and only two months to hit the scheduled reopening on 11/11/11, it was imperative to move as quickly as possible on the innovative design laid out by Desko. “To this end, we needed to work as efficiently as possible, and with WSG offering many of the needed services with a single point of contact, they were a very obvious choice,” Desko recounts. With a number of specific and substantial challenges laid out for WSG, perhaps the greatest was an overhaul of the heating system. The original system was over 30-years-old and long since incapable of providing a consistent and comfortable environment in the open structure; replacement was an obvious requirement for both a private enterprise and visitor center. In its place, WSG installed two new natural gas furnaces that were more than 30 percent more efficient than their predecessor, along with two new high-efficiency air conditioning units. These are controlled by programmable thermostats, another energy and cost-saving measure. This air is carried through all new ductwork, also installed by WSG. Furthermore, the food and beverage offerings required all-new plumbing. WSG installed new water distribution through a reverse-osmosis water filtration system for the coffee machines and other systems. Bathrooms were brought up to code and made handicapped accessible. “We had to take a building that was plumbed for a bank and to change it to one that would be plumbed to meet the exacting standards of Starbucks’ quality control, as well as to meet code for public access at the visitor center,” says PeeWee Thomas, WSG’s lead plumber. The services provided on this project highlight the capabilities of WSG, but the expertise of WSG expands well beyond these services. Clients come to the company to initiate energy audits, building monitoring, upgrades or design-build projects. Typically, with the feasibility study and design-build process, WSG joins the team at the onset of the building’s conceptual design. At this point, the building can be properly oriented and the best renewable energy system can be determined through close coordination with the architect, builder and owner. Savings and service are prioritized throughout every aspect of the system, including WSG’s state-of-the-art monitoring system, which allows maximum performance to be achieved through feedback from the HVAC unit to a professional at the WSG office. “If we observe any problems with a pump, furnace or boiler, our service department is on site before any damage or inconvenience can occur,” explains WSG Manager Evan Lawler. “Owners committed to lowering their bills, along with their environmental impact, have had great success through receiving this instantaneous and valuable data.” In one case, an owner decreased his utility bill from $5,000 to $1,500 per month by making these performance corrections through monitoring feedback. This system allows both the owner and WSG to make temperature and other adjustments from anywhere in the world with an Internet or mobile connection. “This connectivity equates to one simple goal: savings,” Lawler says. These recommendations can cover a wide array of improvements that include high- performance HVAC systems; furnace or boiler replacement; combinations of high-efficiency heating, geothermal and solar; and hybrid systems that maximize the benefits of temperature fluctuations seen in a mountainous climate. With a commitment to making homes and businesses as energy efficient as possible, WSG utilizes cutting- edge technology that allows for the rapid recovery of higher initial system expenses. Through lower operating costs, tax credits and incentives, one- time expenditures are recouped, allowing ongoing savings. Not only wise investments for the residents, these improvements also raise resale values. This logical approach drives the Western States Geothermal ethos.